Phew. And that's your lot. Matthew Henry's report of all of the breathtaking madness is here. And look out for the Test Match Special podcast available later here. Join us for the final ODI in St Lucia on Saturday from 14:30 GMT for a 15:00 start. The leg-spinner held his nerve to take four wickets in the 48th over and bowl England to a thrilling 29-run victory. One of the greatest ODIs ever and it means the tourists take a 2-1 series lead heading into the fifth and final ODI at St Lucia on Saturday. Ben Stokes then bowled Chris Gayle for 162 and Adil Rashid has Jason Holder stumped for 29. But then Carlos Brathwaite and Ashley Nurse hit back, bringing their side back into the game and needing 32 runs from the last 18 balls. Or rather, what could Chris Gayle do? Despite the early loss of John Campbell and Shai Hope, the Universe Boss climbed into the England bowling. He hit mighty six after mighty six and rendered the spinners un-bowlable in reaching his 26th ODI century and also passing 10,000 runs in the 50-over format. On he went, passing 150 with Jason Holder alongside him and West Indies looked like coasting the chase. But Jos Buttler wasn't done yet, launching six after six - hitting 12 in total - to finish with a supreme 150 off 77 balls. England posted 418-6. What could West Indies do? Morgan and Buttler then proceeded to put on a staggering 204-run partnership, full of brutal, beautiful boundary hitting. The England skipper was racing towards his ton, while Buttler built his innings in passing 50 off 45 balls. But then Buttler need just 15 more balls to reach his seventh ODI century, beating Morgan to the mark. Morgan followed to three figures shortly after before falling to the saluting Sheldon Cottrell. England got off to a lightning start thanks to Jonny Bairstow and the recalled Alex Hales, playing in place of the injured Jason Roy. Bairstow smacked 56 off 43 balls and Hales made 82 off 73 balls, falling short of his century thanks to a superb catch on the boundary by Shimron Hetmyer. Joe Root made just five and England were 165-3 when Jos Buttler strode out to join Eoin Morgan at the crease. Some kind words from Chris Gayle and Jos Buttler about each other there (Gayle was laughing when he said Buttler wasn't as good as him). More from Chris Gayle on Sky Sports: "It's important for me to play well in the World Cup. England is a great place to play cricket. This is the last home series for me. I'm pretty focused. I wanted to win the series, not only for me but for the Caribbean people as well. "Jos Buttler is superb. He's one of the best strikers in world cricket today. He's not close to Universe Boss but he'll get there eventually. He's a game-changer and every team needs a player like him in their team." More from Jos Buttler: "I've never seen anyone hit sixes as easy as Chris Gayle can. He's a legend of the game." More from Eoin Morgan: "Chris Gayle in full flow is very difficult to stop and credit to West Indies for giving it their all. "There is not a huge deal of difference between the top 10 ODI teams in the world. West Indies are a young side and have gone toe to toe with us in this series. "Adil Rashid is an extremely strong asset - he can bowl at any time in the 50 overs. He kept his calm and got nice rhythm and purchase off the pitch when he came back on. To get four wickets in an over to win us the game is outstanding. "It was such a close game, we were fighting all the way and the more we play under pressure but keep calm and execute is a real positive for us." 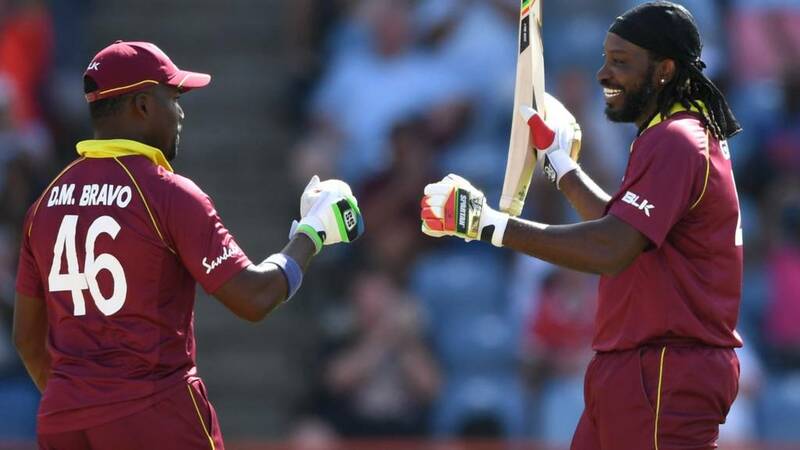 West Indies opener Chris Gayle, who hit 162, on Sky Sports: "I didn't know what was going to happen. Normally when chasing a big total, you give yourself less overs to get in. "Wood bowled well. With his pace, he's always going to be somebody to be wary of. After losing two quick wickets, I said we had to build a partnership but the shot I played in the end was a bit reckless. If I had batted deeper, who knows what might have happened?" More from Jos Buttler: "Joe Root told me we'd need north of 350 on that deck so that was in the back of mind when I came in. Me and Eoin were set with 12 overs to go so it was time to kick on. "One of the strengths of our team is there are no ego so everyone is happy to bat in multiple positions. We wanted the right-hand/left-hand combination so that's why I came in when Alex Hales was out. "It's shows the calibre of Hales that he can come in and perform like that today." More from England captain Eoin Morgan: "Collectively we batted brilliantly and it brought the best out of all of us. Bairstow and Hales got us off to a fantastic start and we kicked on from there. More from West Indies captain Jason Holder: "I just told the guys not to die wondering, just to have a go at it and be fearless. "A few guys got in and kicked on and it was good to see them support Chris Gayle. "To bat against two new balls and be that destructive is so impressive from Chris and to now have scored 10,000 runs in ODI cricket is a great achievement. He's announced he's retiring after the World Cup but he seems to be getting better with age. "Both teams have played outstanding in this series and we're looking forward to the final ODI in St Lucia." More from Jos Buttler on Sky Sports: "It was a great dress rehearsal for the World Cup. No matter who is favourite, on the day there are going to be unbelievable games. "If someone like Chris Gayle is in the opposition then you can lose any match and it was great for us to stand up to that pressure. "My innings was up there with my best, it was really special, I really enjoyed it. When you feel you get into that zone to continue it was really pleasing. "Range hitting is great fun, I enjoy practice - it's one of the best things in the game, it's fun, there are no consequences and I just try to improvise and improve." England captain Eoin Morgan, speaking at the presentation: "It was a hell of a game of cricket and I hope everyone watching it enjoyed it as much as we did. "We were very fortunate for that Adil Rashid spell at the end because we were sitting in second position for the last 15 overs of that game. "We needed something special and Rashid came through." West Indies captain Jason Holder, speaking at the presentation: "The guys really stuck to it, gave it a good effort. Credit to Chris Gayle, the way he batted was outstanding and unfortunately we weren't able to get over the line in the end. "It was a good surface to bat on, the ball went around the park and the bowlers struggled to contain. "Buttler and Morgan had a good partnerships to set it up for them and we just had to go after it from the start - we just couldn't get there at the end." Jos Buttler, who hit 150, on Sky Sports: "It was hectic, I'm just trying to catch my breath. It was an unbelievable game of cricket. "As a side being put under immense pressure, we showed character to come through it. For Adil Rashid to bowl that over at that time was very special. "We just needed wickets all the time. We knew if Chris Gayle batted long enough then they were going to win, which was incredible given we had 418 on the board. "Mark Wood was fantastic and Adil Rashid wants the ball in those situations - his spins it both ways and that's very hard to get away." And Jos Buttler is given player of the match for his stunning 150. Feel for Chris Gayle, hitting 162 and not getting it.